But the one text she had found truly memorable and compelling was the passage she had memorized without even really understanding what it meant. Something about spirits or souls that were perfectly round once upon a time but had been split apart. For as long as they were separated they would search out their other half until they found it. That is how she imagined love: a meeting of spirit-twins. Some of those who fancy themselves philosophers claim that God, Mighty is He, created every soul in the shape of a ball. And then He split every one of these spheres into two, and apportioned to each and every human body one half. 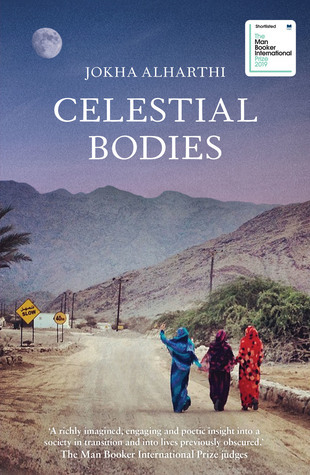 What made Celestial Bodies an intriguing read for me was the way it’s unabashedly a story from another culture, faithfully translated into English with only a brief introduction. There’s a character who appeals to God all soliloquy-style right on page 5, and the idea of slaves brought from Africa is not as distant as it might be in the European context today (not to belittle how much there is still modern slavery all over the world). On the other hand, the story is relevant and relatable in the Western context (hence the Man Booker International nomination) because with a theme as universal as love you are evidently dealing with the general human condition. She looked the mirror-figure in the eye, and both of them shivered. It was the thought that she was about to join the other half of her, the self which had been separated from her self ever since earliest creation. I’m drawn to this theme because it coincides with a book I’m reading for research very slowly, the German philosopher Peter Sloterdijk’s massive Spheres trilogy, where he charts, among other things, the ways human life has been depicted in images of spheres – i.e. round spaces that collide and coalesce – in art. It’s a fascinating book that enriched my reading of Celestial Bodies.